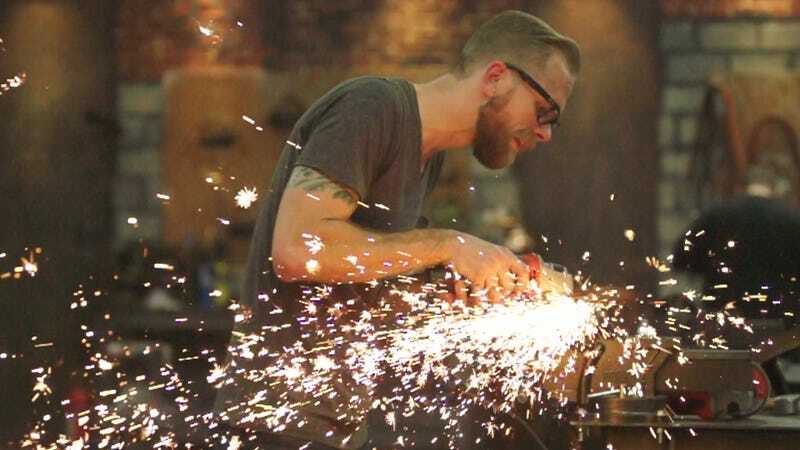 Fire is fun and bladed weapons are always cool, but a fan of History’s Forged In Fire—in which people compete to make badass swords and other sharp objects—recently learned that it’s probably better to leave the fire and weapons to people who actually know what they’re doing. This comes from The New York Times, which says a man named John Gomes set off a huge fire when he tried to forge a piece of metal over a barrel near his house in Cohoes, New York. The problem was apparently big gusts of wind, which reached 30 miles per hour and sent sparks to nearby apartment buildings. Those sparks set off a fire that eventually destroyed three residential buildings (including Gomes’ own) and damaged 28 others, but The New York Times says that nobody was seriously injured. Cohoes mayor Shawn Morse, a former firefighter, said that Gomes was “trying to bend metal and make a hammer or something,” adding that the cost to repair the damage could end up being “a few million dollars.” Gomes has been charged with felony counts of arson and reckless endangerment, and he apparently made “statements that implicated himself.” It doesn’t seem like History has commented on this at all, but maybe it would just be a good idea for everyone to avoid replicating the things they see on that network. Forged In Fire aside, it shows a lot of war stuff that is probably best left to the TV people.